On August 16th, after several extremely difficult goodbyes, I departed from Charlotte-Douglas to join 84 other YAGM volunteers,YAGM program staff, and YAGM alum at U-Chicago for 8 days or orientation. During this time we had several intentional conversations around intercultural competencies, race, gender, the historical context of mission work, what it means to live with the privilege of being a US citizen in another country, safety and security, and how to prepare ourselves spiritually for the challenges ahead. Although the days were long, hot, and humid-as a born and bred southerner, I definitely didn't think it could be humid in the Midwest-they were filled with worship, stories from past YAGM participants, support from our small groups, and lots of fun too! As the end of the week drew near, so began the difficult goodbyes with friends who were heading to years of service in other countries. 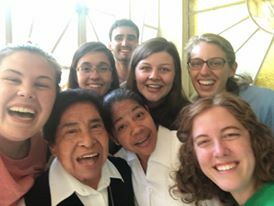 However, I am so humbled and amazed to be participating in this program, and to be in community with 84 other young adults serving all over the world in Argentina/Uruguay, the UK, Jerusalem/West Bank, Rwanda, South Africa/Swaziland, Senegal, Australia, Cambodia, Hungary/Central Europe, Madagascar, and of course, Mexico. 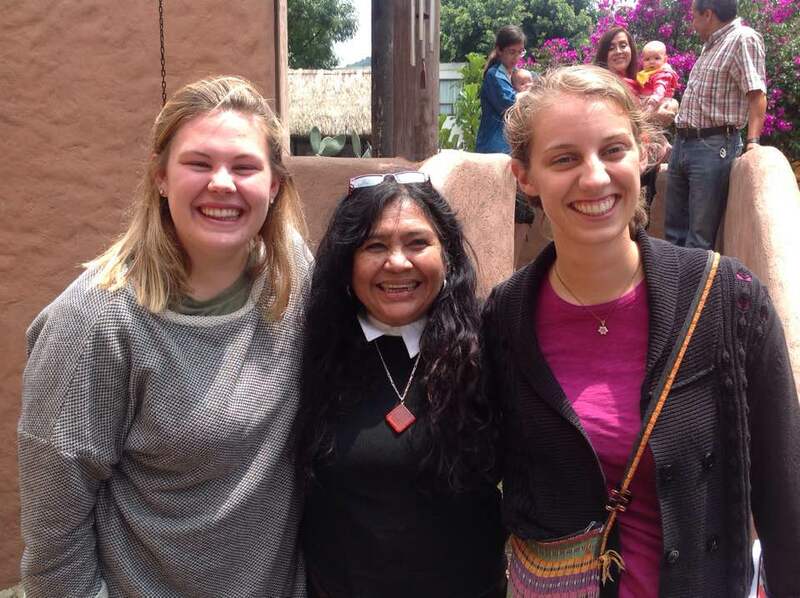 Tar Heels born, Tar Heels bred...my fellow UNC-YAGM volunteers, Alyssa Buchanan (center) who will be serving in Swaziland, and Hilda Santiago (right) who will be serving in Argentina. You best believe I'll still be cheering on the Tar Heels this year from Mexico! Lutheridge/Lutherock YAGM volunteers! 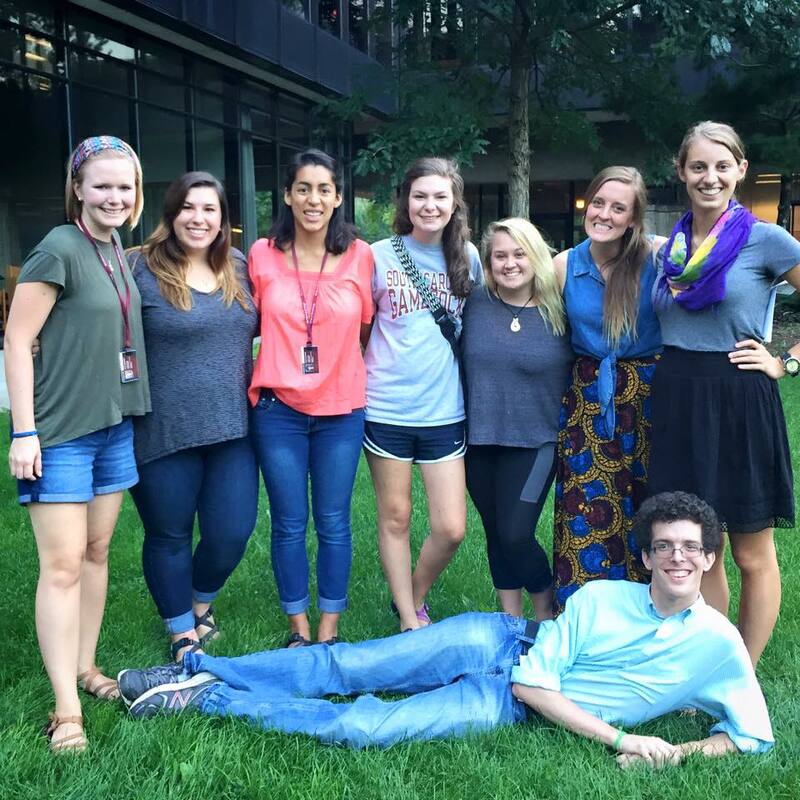 I know many YAGM program alum from camp, and hearing their stories first sparked my interest in the program. Working at camp was hugely influential in my faith journey, and I can't wait to journey with this cloud of witnesses this year. 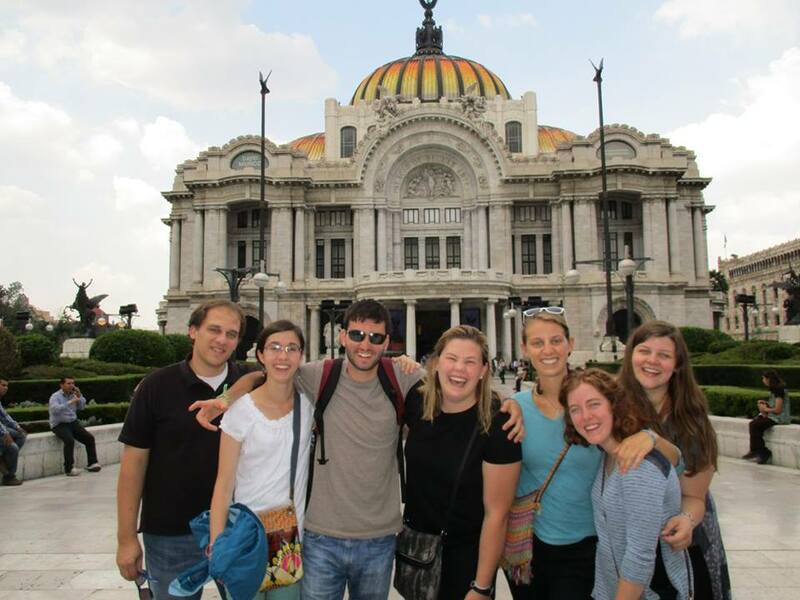 On August 24th, the YAGM-Mexico crew departed from Chicago to Mexico City, where we were joined by our fearless leaders, Omar Mixco and Lindsay Mack. Omar and Lindsay have served as the program country coordinators for the past three years and are incredible people. 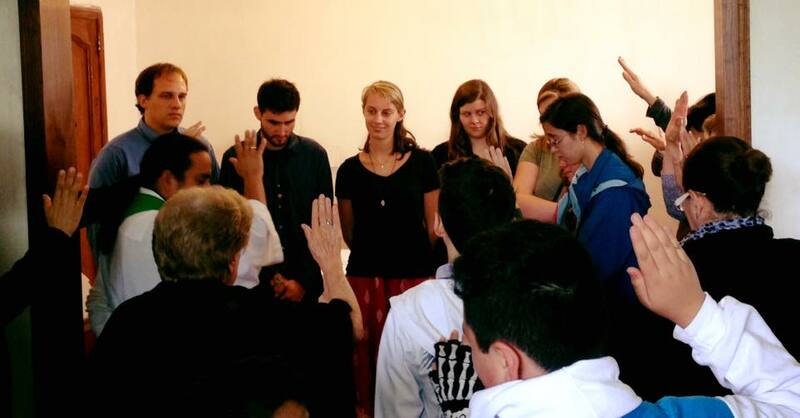 We began our orientation at the Centro Guadalupano, a retreat center for a benedictine order of nuns. We were nourished by the food and care of the wonderful sisters, many of whom have their PhDs, and all of whom are very progressive and actively work in social justice issues. Amidst our conversations about security and safety, the history and culture of Mexico, the details and logistics of our site placements, and expectations for the year, we had the opportunity to visit the historic center of Mexico City and the Basilica of the Virgin of Guadalupe. We've had a lot of time to bond as a group, which includes people from 5 states, 7 different schools, and a variety of backgrounds. I'm so grateful to be a part of a fun, adventurous, warm group of people, who will be serving in a variety of places in south-central Mexico. 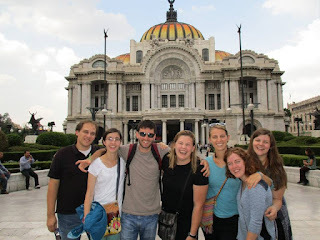 The whole crew-Tim, Emily, Justin, Anneka, myself, Jeanette, and Stephanie (left to right), in front of Palacio de Bellas Artes in the historic center of Mexico City. Sister, sister...hanging out with the awesome hermanas at the Centor Guadalupano. 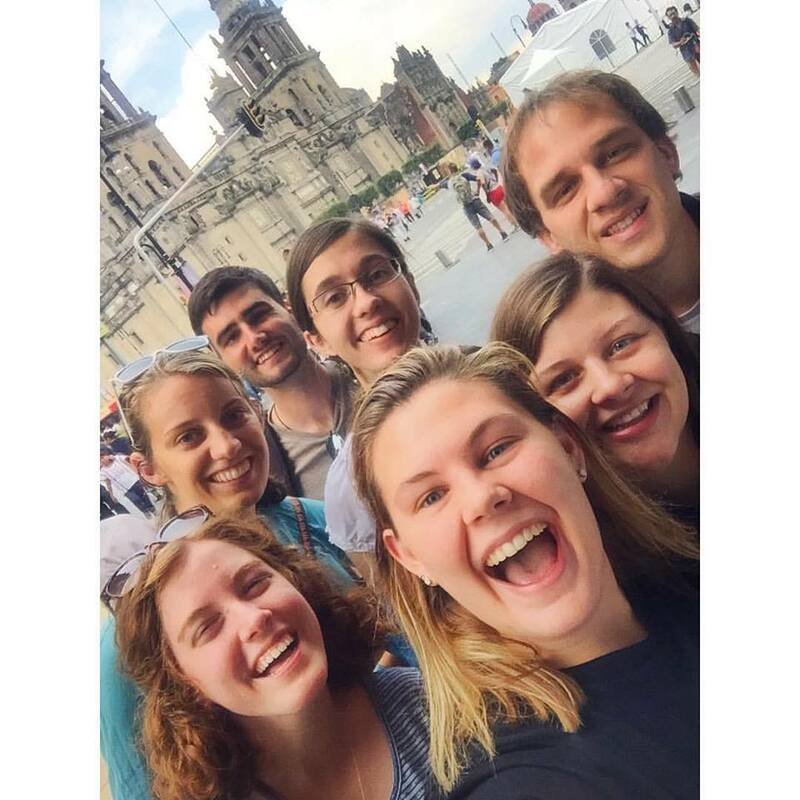 We like selfies...the crew in front of Plaza de la Constitucion, in the heart of CDMX. On August 28th, after meeting the congregation of Buen Pastor, a bilingual Lutheran church in Mexico City, and having a discussion with Pastor Miguel about the theology of liberation (more to come on that in future posts), we departed for a week of language school in Tepotzlan, a small town outside of CDMX. We complete 30 hours of intensive language training, with our fearless leaders/teachers from a local language school. While my Spanish has definitely gotten rusty since my semester in Sevilla, Spain, it was comforting to review grammar, learn more about different vocab/terms in Mexican Spanish, and fall back into the rhythm of speaking more. One of my goals this year is to learn as much Spanish as possible, so I am excited to be back in an immersive settings. We stayed in host families, and Emily, Jeanette, and I were hosted by the lovely Dona Socorro and her family. Among being a warm and wonderful host, Dona Socorro and her family are also amazing cooks, which leads me to another one of my goals for this year: eat as much as possible. The food here is amazing-piping hot tamales, quesadillas, tacos al pastor, enchiladas, and of course, lots of tortillas and beans. I am currently trying to build my spice tolerance, which as of now, is sadly lacking-upon trying Dona Socorro's salsa, which she promised was "no muy picante" (not very spicy), my mouth promptly felt as though it was on fire. After our language classes, we had lots of time to explore the town of Tepotzlan, which is a pueblo magico situated among the gorgeous verdant mountains. 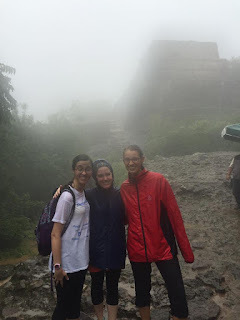 One of the highlights was the strenuous hike up the mountain to the pre-Hispanic Tepozteco pyramids, followed by an immediate descent in the pouring rain, on a rocky trail that more resembled a waterfall than a trail. Another highlight of the week was being invited by our lovely host sister to hear a local salsa/cumbia/reggae band, which leads me to third goal-to hear as much live music as possible. After 14 years of classical piano training, I am excited to explore the rich, diverse musical landscape of Mexican music-but hopefully, I can also find a piano to keep my skills sharp. Being commissioned by the congregation of Buen Pastor Lutheran Church in CDMX. Our very soggy hike to the Tepozteco pyramids in Tepotzlan. Our fearless leader/language instructor Irma! 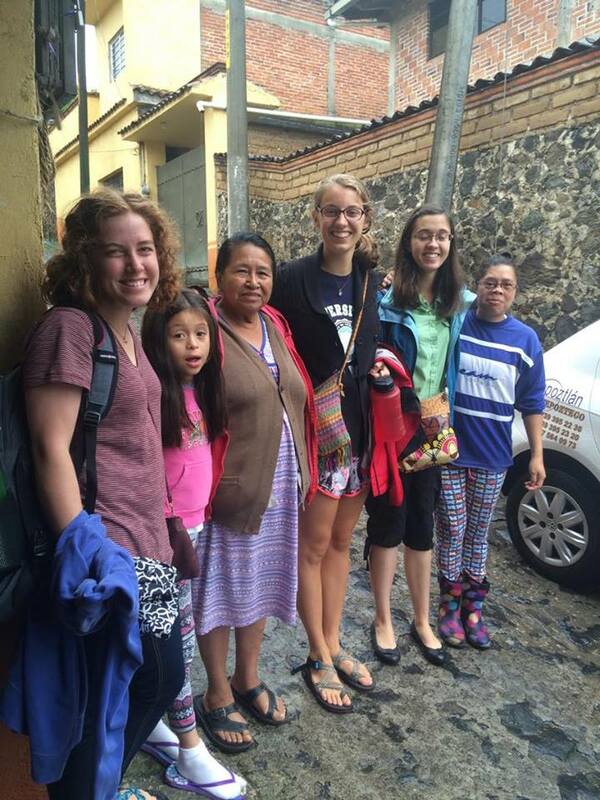 Dona Socorro and our lovely host fam in Tepotzlan. After sad goodbyes to our host families, we returned back to CDMX, for our final few days or orientation. On Thursday, we will move in with our host families, and the following Monday, we will officially being our work! As hectic and sometimes overwhelming as these weeks have been, I have been overwhelmed by the generosity, hospitality, and warmth of the people I have met here. Opportunities like these are a rare privilege, and I am so grateful that I have the opportunity to participate in such an amazing year. Although I know that this year will contain challenges that I cannot yet begin to imagine, I am excited to explore and learn from the people and communities of our southern neighbor. 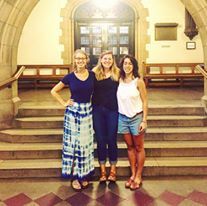 In our Chicago orientation, YAGM staff talked about how if we keep our eyes open, we will see God transforming "the mundane into the magnificent" this year. My fourth goal this year is to write down my high, low, and God-moment every day this year (I have long realized that setting the goal of writing a long journal entry every day is a little too lofty). As I flip through my entries these past few weeks, I find that my God moments are not giant, "significant" moments, but the little moments that make up everyday life-shooting the breeze after dinner with our host family, seeing the clouds clear after a torrential thunderstorm in Tepotzlan, holding a happy baby, or laughing at a silly YouTube with the group. I will not be changing the world or dismantling any systems of oppression this year-but I hope that by keeping my eyes open to the every day holy moments found in the everyday minutiae, I can better see how God is working in this beautiful, complex, diverse, warm, and evolving country. Thank you for all your support and encouragement-please send me any comments, questions, or concerns you have! Thanks to the generosity of my family, friends, home congregation, and many other donors, I am fully funded (! ), but if you are interested in contributing to the growth and availability of the YAGM program for future volunteers, please feel free to donate on my personal page at http://support.elca.org/goto/MadisonBurke.